Committed to seeking justice for those injured in Missouri. I am Jeffery A. Hanna, founder of this law firm. I personally make sure that every client of the Law Office of Jeffery A. Hanna receives personalized service and aggressive, effective representation. I personally oversee and/or negotiate every case myself because I want to ensure you are receiving the best result possible. Over the 20 years I have been practicing personal injury law, I have developed a unique reputation for providing superior personal attention to each and every client while obtaining outstanding results. Contact my law office by phone or e-mail to schedule a free initial consultation. I look forward to hearing from you. When you need compensation for the injury, pain and loss you've suffered in an accident, who should you call? When financial relief matters, don't leave your options to chance. Success comes from making the correct choice in your case's representation. That's why we take fewer cases - so we can work harder and more focused for you. Allow us to help you! Jeffery A. Hanna has recovered millions of dollars for his clients. At the Law Offices of Jeffery A. Hanna, we have spent more than two decades as a personal injury lawyer fighting for justice on behalf of injury victims and their families. We understand how difficult it is to deal with physical, emotional and financial issues in the wake of a serious or fatal injury. Our experienced team of professionals has a well-earned reputation for providing caring, yet aggressive and high-quality representation to our clients. In times of crisis, the advice of a personal injury lawyer is a valuable resource. If you or a family member has suffered serious or fatal injury in Missouri, please contact Jeff today for a free consultation. We have served as an accident and personal injury lawyer to help hundreds of satisfied clients get the fair and just compensation they deserve. Now, we are here to help you. You can rely on our support in multiple areas of law. As a Missouri personal injury lawyer, Jeffery A. Hanna works with clients who have suffered injuries in all types of traffic accidents, including auto accidents, pedestrian accidents, bicycle accidents, trucking accidents, motorcycle accidents, and school bus accidents. He helps those injured on the job in the Jackson, Cass, Pettis, Henry, Lafayette, and Johnson County areas of Missouri receive the justice and compensation they need. When it appears a third party is responsible for an accident and resulting injuries or wrongful death, he will assist in seeking recovery. Our medical malpractice lawyers also deal with cases involved wrongful death or injury caused by the malpractice of medical professionals. As dedicated malpractice lawyers, we can help you and your family recover and receive just compensation. Also, as a Missouri premise liability attorney, Jeffery A. Hanna also handles a host of related claims, including dog bites, defective products, sports accidents, slip and fall cases, and medical malpractice. 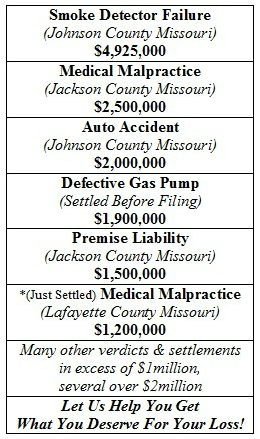 Why choose the Law Office of Jeffery A. Hanna for a Missouri injury accident? Attorney Jeffery A. Hanna, ensures every client receives personalized service and aggressive, effective representation. In more than 21 years of personal injury practice, Mr. Hanna has developed a reputation for providing superior personal attention to each and every client while obtaining outstanding results as a veteran Missouri accident lawyer. You deserve to work with a personal injury lawyer with a proven history of high level results. Warrensburg and Kansas City personal injury lawyer Jeffery A. Hanna is committed to you. Many personal injury and malpractice lawyers claim they will fight for you. They also make claims concerning how much money they can get for you. The difference between saying it and actually doing it is huge. Mr. Hanna is successful because insurance companies know he will file suit and go the distance on your claim. The Hanna Law Office is conveniently located at 223 E. Market Street in Warrensburg, MO. You don't need to drive to Warrensburg to start the conversation with the Law Offices of Jeffery A. Hanna. Contact us today at (660) 747-2550 to discuss how we can help.